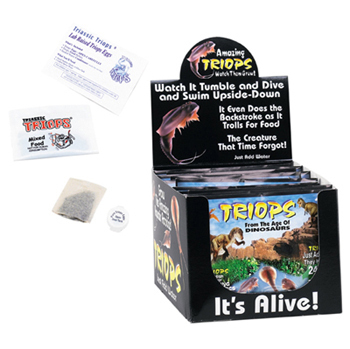 << Back Triops Eggs: Countertop Pkt. Pure Triops eggs are packaged. Begin hatching these dinosaur-era creatures by adding 100 ml of water and 3 spoons of nutrient to a clear cup, tray or tank. You will soon be utterly amazed by their aquabatics. Hatch triops by just adding water. Feed them and watch them grow. They hatch in just 24 hours and grow up to 2" long. Watch science come to life. Package contains eggs and food (aquarium is not included) with instructions.